Confirmation is required prior to despatch. Stylish industrial design furniture, well crafted and sturdy rectangular console table, tops are made from distressed solid Acacia wood l acquered in a warm walnut finish, steel framed and cast iron wheels. Amount of rust varies from item to item. The rust effect is superficial and varies from item to item - If you want less rust just use black shoe polish to change appearance. Would suit any traditional or contemporary room setting creating a superb feature. Acacia wood is especially prized for furniture because of its durability, lustrous finish and varied shades. Acacia/ Samanea Saman wood is also known as Monkey Pod or Rain tree. They are a moderately fast growing tree that is used in agro forestry as a shade or shelter tree for crops and can also be seen along many roadsides. It is prolific in many countries and invasive in some. It is harvested/ replanted on a regular basis. This item would normally only be available through a high quality Gift/Furniture store or Interior designer. Brand New in Original Box - Fully Assembled. In order to give better service we check most items prior to dispatch. SUPERB RANGE - VARIETY OF LISBON INDUSTRIAL PIECES AVAILABLE. Viewing Welcome at Our Birmingham Showroom. Please Provide Two Contact Numbers. (excluding Scottish Highlands & outlying areas) For Scottish Highlands & outlying areas please contact to obtain a quote. EXTRA COST IN MOST CASES. All pallet services require a signature, pallets are delivered to kerbside ONLY dependant on access and location, the driver is not insured to take items into the premises. You must be willing/able to unpack & dispose of pallet & packaging /move your items into your premises. It is your responsibility to make sure the furniture will fit though your door ways and up your stairs. Never leave a part opened pallet unattended in a public place or in the rain. Do not open the boxes packaging with knives that may reach the item - take out of box carefully only. Stand on ground the correct way. Never allow any item to get wet or store in a damp area as the wood expands. Furniture left in direct sunlight may fade- solid wood furniture placed next to radiators or left. In over hot rooms may lose moisture and contract causing splitting. If we need to collect the item for any reason and you have disposed of these we will either be. Colour may vary due to lighting conditions when photographed. All prices include Vat at the current rate. Designed to add a unique touch of sophistication and class to your interior. An ideal gift for friends and family on any occasion. This item would normally only be available through a High quality Gift/Furniture store or Interior Designer... Please feel free to browse our shop for other items. Add our shop to your favourites list and sign up to our newsletter for new listings and special promotions. HIGHLANDS/ISLANDS OF SCOTLAND, OUTLYING AREAS & NORTHERN IRELAND DELIVERIES. TR21 thru TR25 inclusive (only). AB36-38, AB55-56, FK17-21, HS, IV, KA27-28, KW1-14, KW15-99, PA20-99, PH19-99, ZE. INTERNATIONAL DELIVERIES: PLEASE PROVIDE A CONTACT NUMBER. Our postal rates/services are for UK MAINLAND ONLY - We deliver to Europe (see exclusions). If you require an alternative address after ordering we will need to cancel your order and advise to re-order with preferred address selected. The company has been dealing in quality contemporary and reproduction items for over 25 years. It is company policy to use recycled materials to pack your items wherever possible. We have invested in a cardboard shredding machine which reduces greatly the need for man made cushioning. After checking your items please recycle as much as you can. 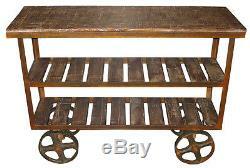 The item "INDUSTRIAL CONSOLE TABLE IRON WHEELS SHELVES SHABBY CHIC SOLID ACACIA WOOD" is in sale since Monday, March 5, 2012. 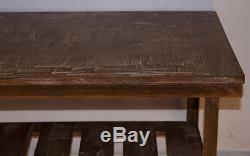 This item is in the category "Home, Furniture & DIY\Furniture\Tables\Other Tables". The seller is "middle-england" and is located in Birmingham. This item can be shipped to United Kingdom.